Jose Mourinho will stay silent to Real Madrid journalists (Satire) | Make Time For Sports. 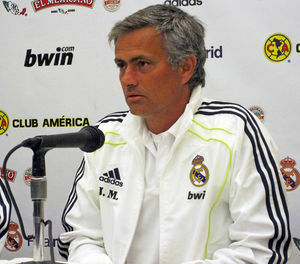 Jose Mourinho, enfant terrible, has been disciplined for his extraordinary press conference following Real Madrid’s 1-1 draw against Barcelona on April 16, 2011. The fiery coach completely ignored Madrid journalists and answered questions only from Barcelona-accredited reporters and members of the international press. After being summoned by Real Madrid honorary president Alfredo di Stefano and president Florentino Pérez, it has been decided that the Portuguese manager will learn sign language to communicate with Real Madrid journalists. This is seen as a real concession by the management of the most successful club of the 20th century. Local journalists are not amused. They feel that it will increase their workload if they are forced to learn sign language. They say it will add to the atmosphere of distrust; they feel that just understanding the temperamental coach and making themselves understood to him ,under normal circumstances, is a “Herculean effort in patience”. Newspaper proprietors are equally displeased. “If our reporters do not pick up sign language quickly, they will be obliged to rely on translators.This will increase our overheads.” says the owner of a leading Madrid newspaper. Real Madrid F.C. has moved quickly to assuage journalists and have reassured the press that it will be their responsibility to provide a translator at press conferences. It is rumoured that the Real Madrid management are a superstitious lot and do not wish to make too many changes lest their team’s progress under Mourinho is derailed in any way.